In terms in remaining in close contact with family, the good news is that half the CAFE group meet up with them weekly or daily and 80% of them at least speak to them weekly or daily. This is a very positive result for half the group. 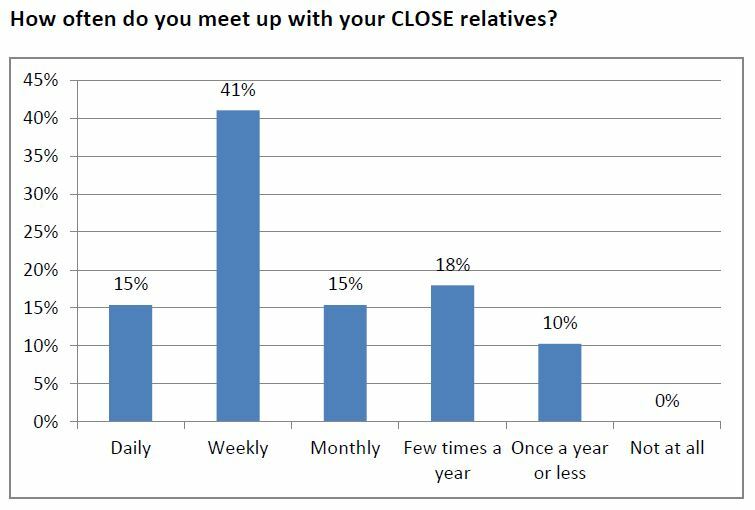 The not so good news is that the other half of the group only meet up with close relatives monthly or less – possibly because their children have moved away. Furthermore 20% of this latter group only speak to their relatives monthly or less. 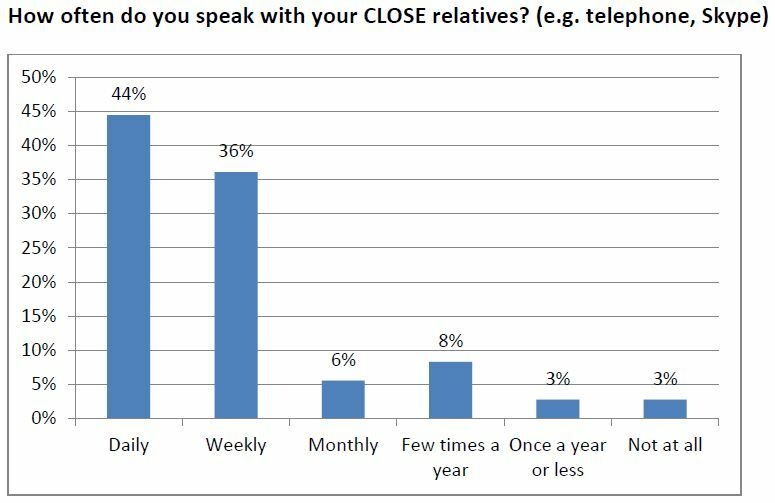 Footnote:- Although currently only 40% of the group use Skype, making this available to the whole of this group would enable them to maintain more regular visual contact with relatives as well as friends. In the CAFE group in terms of other links 64% of them had three or more close friends. Leaving 36% two or less close friends. In a less active and less mobile group, you might expect these numbers to be reversed. About two thirds of the group said they made friends easily whereas the remaining third said that they didn’t. Footnote:- The survey group meetings themselves generated a lot of discussion and interaction between people and there’s no doubt that friendships could easily be made in CAFE groups but there has to be a trigger to get the discussion started. It’s not difficult to see that after this new relationships could easily develop. Interesting? Intrigueing? A very profound look at life and what one does, with close family ties. The answer eludes me: One has to be active in maintaining the ties. The younger generation have their own life styles, and responsibilities, one cannot become intrusive, or too dependent, but to show love one they have to be involved at the pace that the younger dependents can endure, Siblings are a different matter, and again one here may have a bond, which is unwritten, but again maybe infirmity, economics, and reality of old age may not allow them to meet as frequently as they may wish, and the older one becomes the more difficult, these meetings may become. The telephone, ‘skpe’ are the answer, with frailities such as sight and hard of hearing again these may excassibate the periods of meetings and their frequency: However they are a comfort if some one is their to lead one through the maze of ‘jargon’ to make these ‘skpe and telephone(Mobiles) user friendly’. If or should one be blessed in old age with a still surving parent, uncle, aunt then one has to find a way of communication, and a frequency that is gratifing: then personal touch and communication even for a few minutes can express more than a technical link such as ‘skpe’ or the telephone. Where do friends come in this maze of conversation and social groups? Well they help with ones learning and commmunication skills with talk, touch, feelings, and emotion on how fragile one may be come, and again isolated or lonely in old age. We need each other, to look, learn and to listen, and give some meaning and enjoyment to life. Lif in old age is still an adventure, or at least I belive that too be true!! !